(1) Link to New Yorker article. 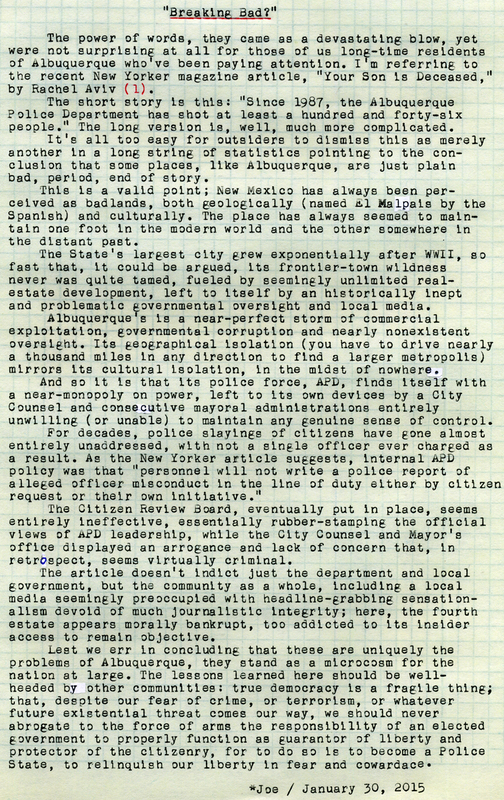 Post-Script: The moral failure of Albuquerque's city government to effectively oversee the power of its police force should serve as a shot across the bow for the rest of the county, as we are reminded of our inept, bankrupt national government and the consolidation of power in an ever-expanding national security apparatus. 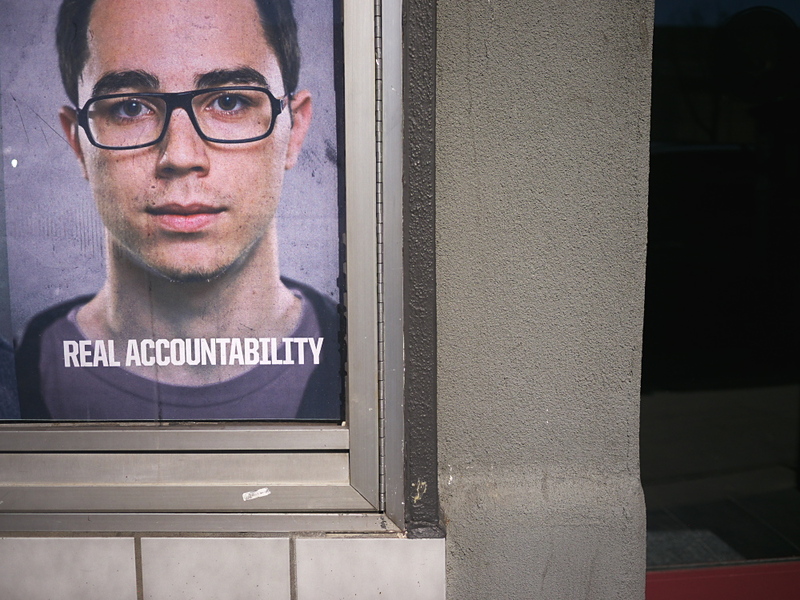 Yes, pay attention to what happens here (and in your own community), for it mirrors what's happening elsewhere. You owe it to yourself to read the New Yorker article, and heed its warnings. One important point made therein was an attitude expressed by many citizens, especially from the more affluent sectors of the community, that "...the police are doing a good job, and they ought to shoot more criminals." I am reminded that, under the constitutional rule of law, the police don't have the privilege of declaring a citizen a criminal; that right is retained solely by due process of law, after the facts have been independently verified and the person tried & convicted by a jury of their peers. Otherwise, as in other examples we've seen throughout history of a Police State run rampant, they effectively become judge, jury and executioner. Is that the kind of society we desire to live under? Is this how we should be conducting our national and foreign policy? I don't write these words lightly. Over the years (since 2006) I've tried to keep the tone of this blog above the fray of politics, for that is not my forte or area of primary interest. However, what most alarmed me from the New Yorker article were suggestions of witness intimidation and outright threats, reminiscent of the tactics we've seen in the past by organized criminal syndicates and tin-horn military dictatorships. We, who publish such ideas, should be ever cautious and tread lightly, for words have power; and cockroaches, they fear the light. Typecast via Smith-Corona Silent; photo via Lumix G5. 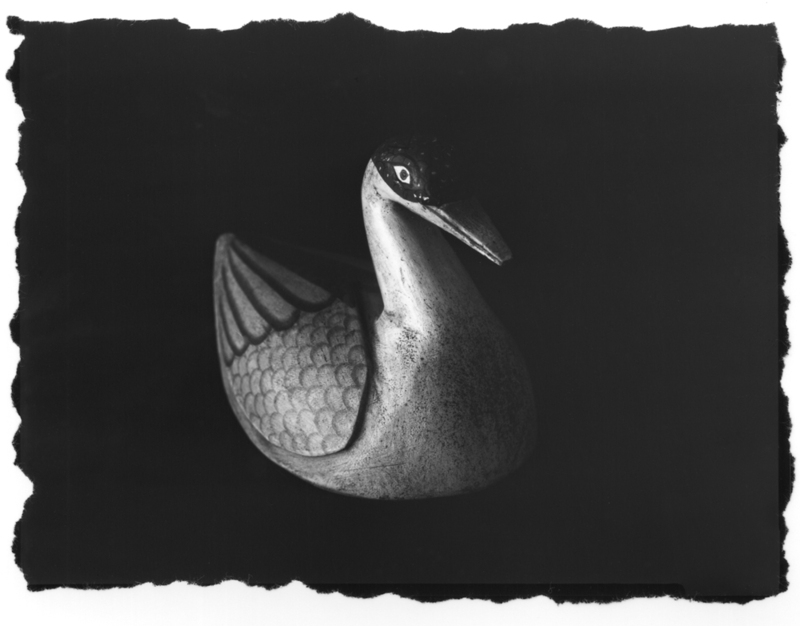 Post-Script: The passage of time is sufficient such that these methods for creating photographs are no longer traditional, but instead are rather obscure; especially considering the use of graphic arts film in place of conventional sheet film, that has itself shot up in price. 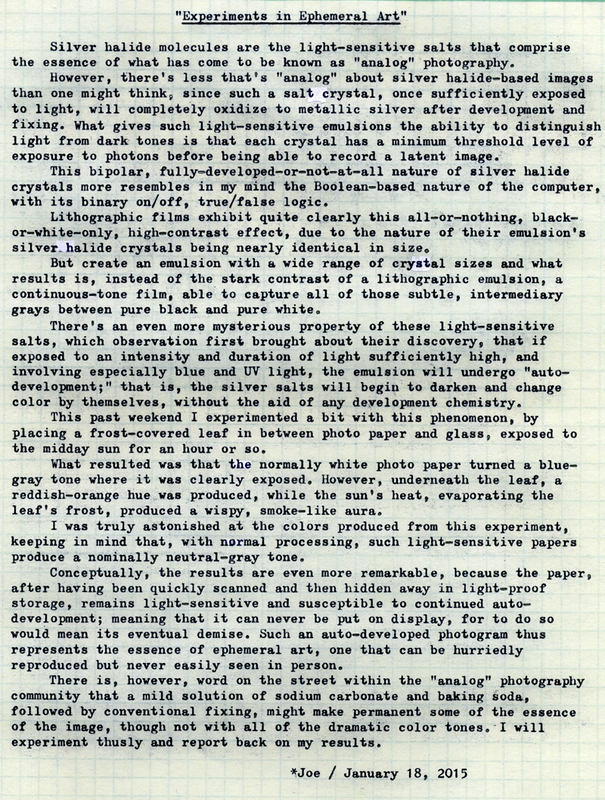 One can only hope that these materials - light-sensitive films and papers - will remain in manufacture into the foreseeable future. Post-Script: This little experiment in auto-developing silver halide paper reminds me of the field of conceptual art, where the central idea is not built around a gallery-like public viewing space, but exists more in the mind and experience of the artist himself. Typecast via Hermes 10. I took it apart and did some major cleaning, degreasing and relubrication of key internal areas, while also replacing the ribbon. With the externals now cleaned up, it's an even sweeter of a machine to use. 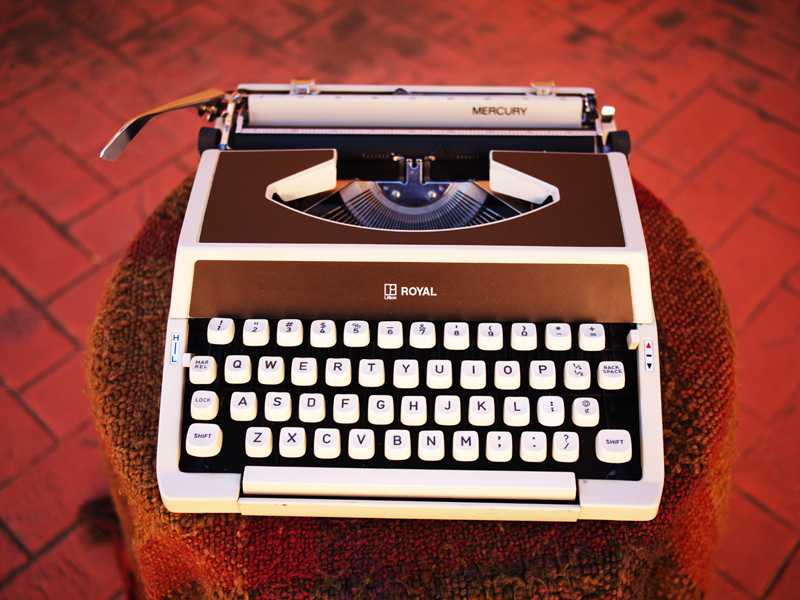 Post-Script: It's funny to speak of typewriters as being one's friend. My last blog article used the term 'friend' in reference to a Royal Mercury, while today's reference is as an old family friend. 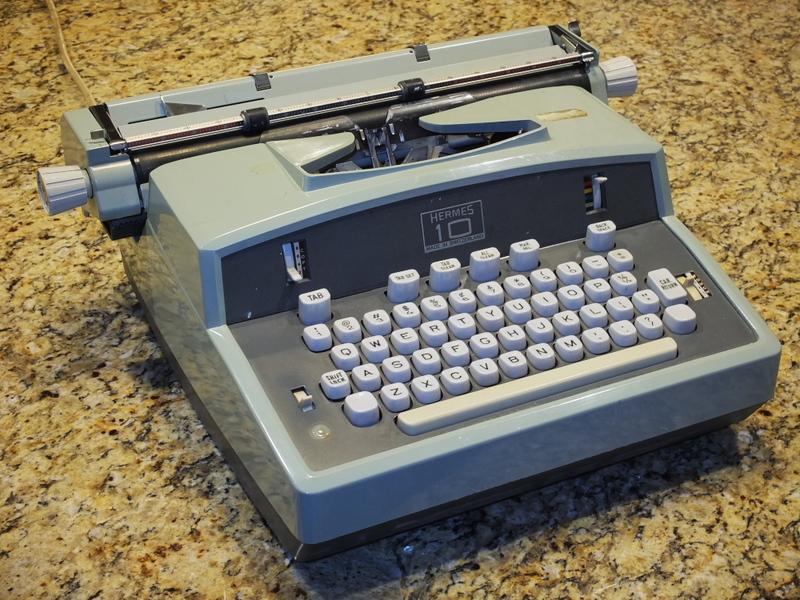 But really, this one's been around my family since I was a kid, and only recently - since I've become more typewriter-conscious - can I relate to its significance on a personal level. 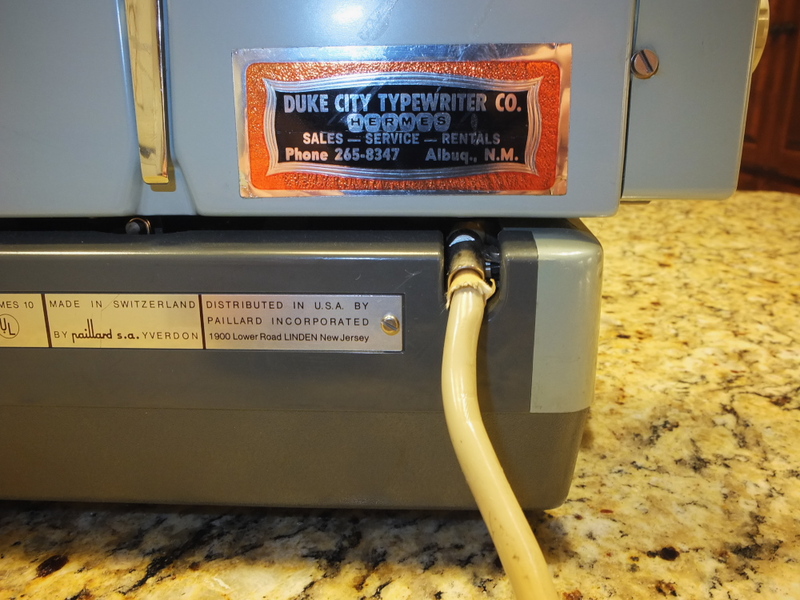 Could I find myself using this electric more and more over the other nine manual typewriters currently in my life? No, definitely not. 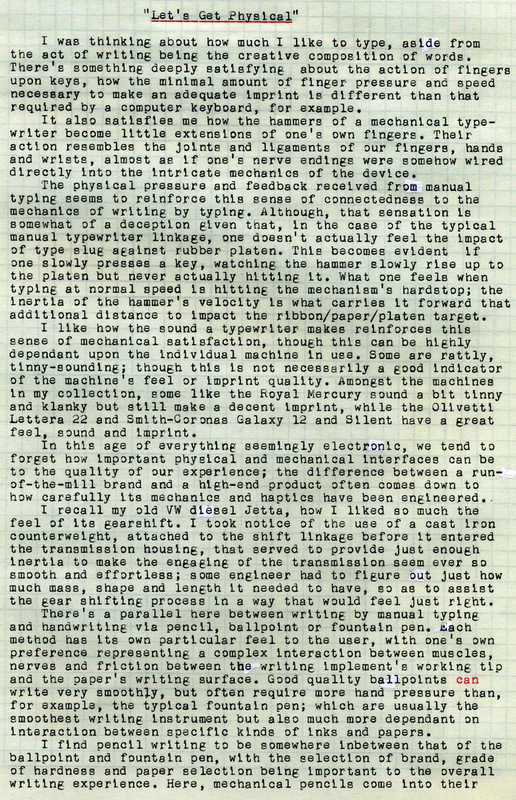 This is in no way a disparaging comment on the Hermes 10's merits as a well-engineered writing tool, but rather says a lot more about the unique tools that are manual typewriters; especially, in my view, well-engineered manual portables. 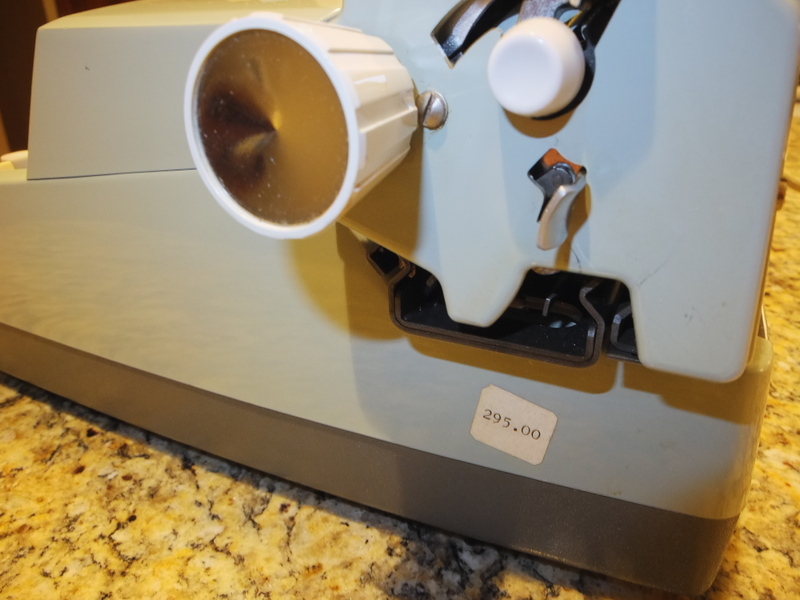 So, while the Hermes 10 is a workhorse machine, it's also bulky and heavy, requiring a power cord, and in no way is any more quiet in operation than any of my manuals. For creating rapid written copy to the ultimate aim of paper-printed output, a manual portable is so much more convenient than either a computer/printer combo or electric typewriter. 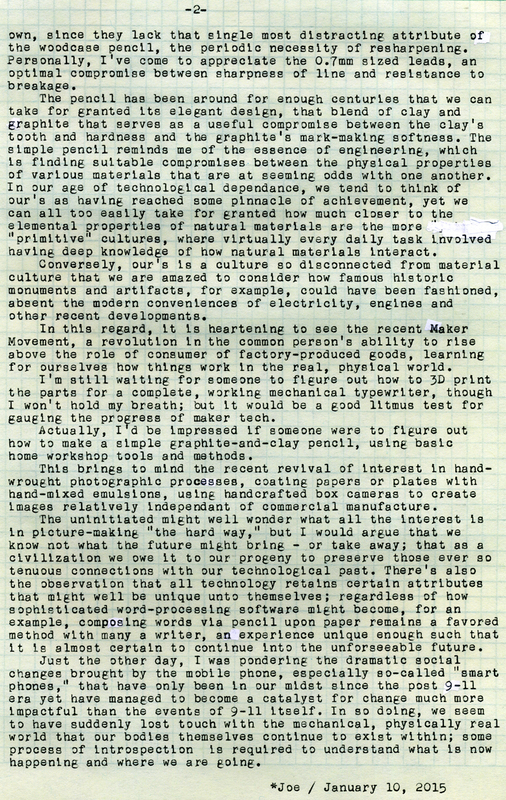 There's also the philosophical view that manual typewriters are entirely hand-operated, which reminds me of the noted comment (by I think Henri Cartier-Bresson) about the hand being a link between the eye and the heart. You get that hand/eye/heart experience with manual typewriters, but not so much with computers, or even this very nice electric. For me, the difference is the electric/electronic mediation, fostering a dependency upon corporate/government/social infrastructure; whereas with a manual typewriter you can set a chair up on the porch of your cabin, or on the shore of the lake or ocean, far removed from any nuclear/coal/gas-fueled power outlet, and write to your heart's content. 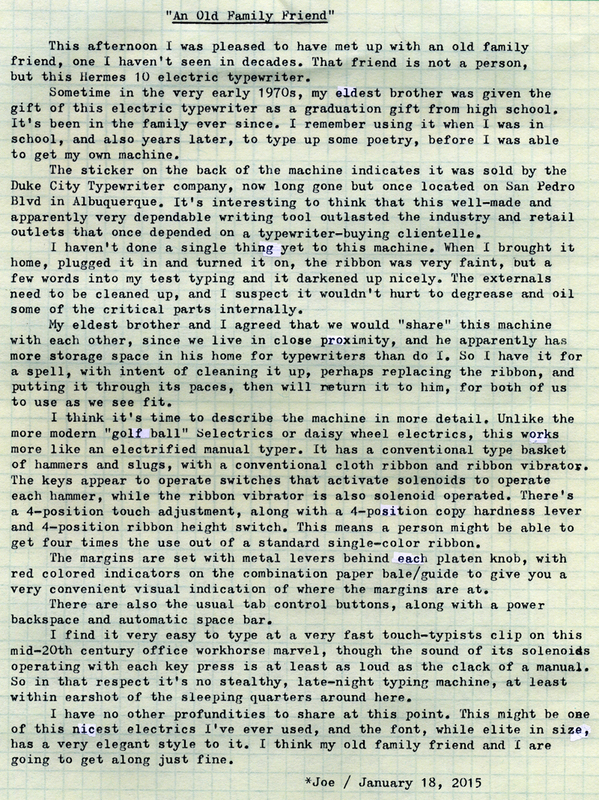 Manual typewriters are a self-contained experience, which this old family friend reminds me of, in spite of its elegant mid-20th century engineering. 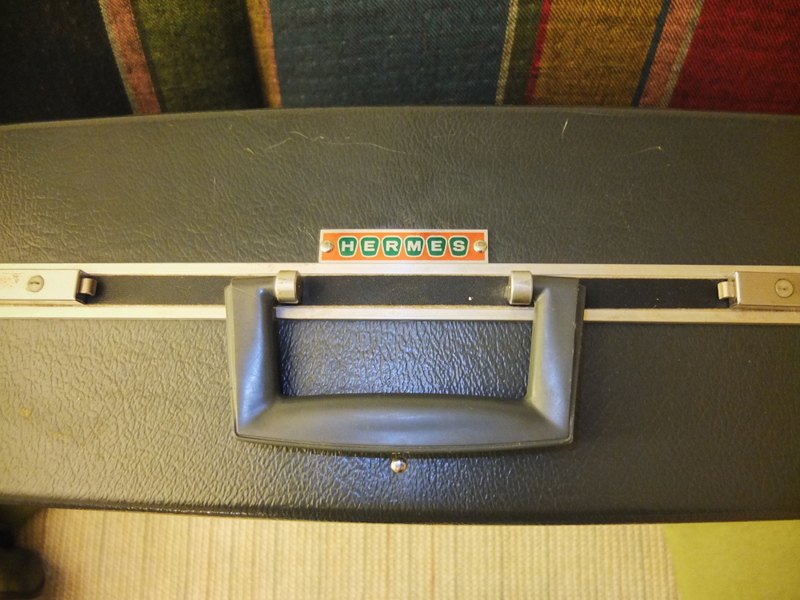 A close up of the carrying case; there's also a Hermes dust-cover for the machine, but alas, no owner's manual. Post-Script: I again typed the first draft of this article out on the front patio in the warm noonday winter sun, onto children's manuscript paper. 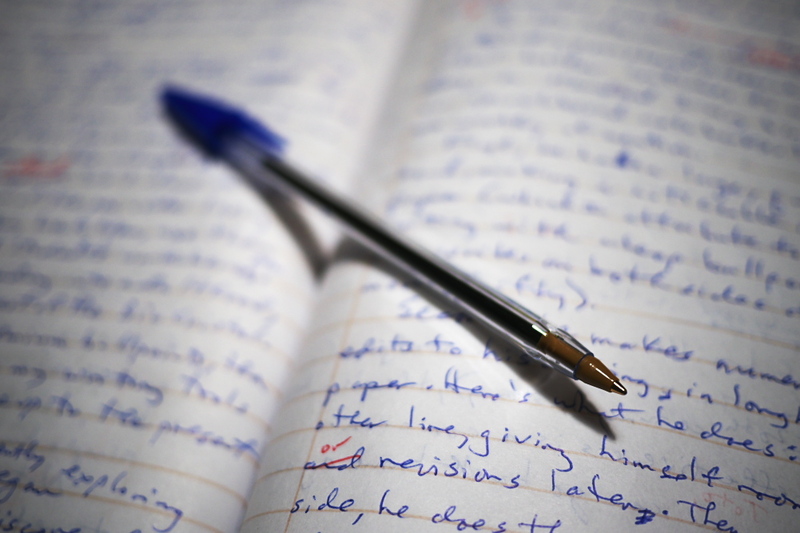 This Royal offers 1-1/2 line spacing, wide enough spacing for edits to be handwritten yet narrow enough to get a significant amount onto each page. The first draft went two pages, which is usually sufficient to permit the finished product to be fit, single-spaced, onto one sheet but, in this case, I had to edit out a few paragraphs, including some colorful descriptions of the old Senior Chief's rather carnal pastimes; that in retrospect were best left out. 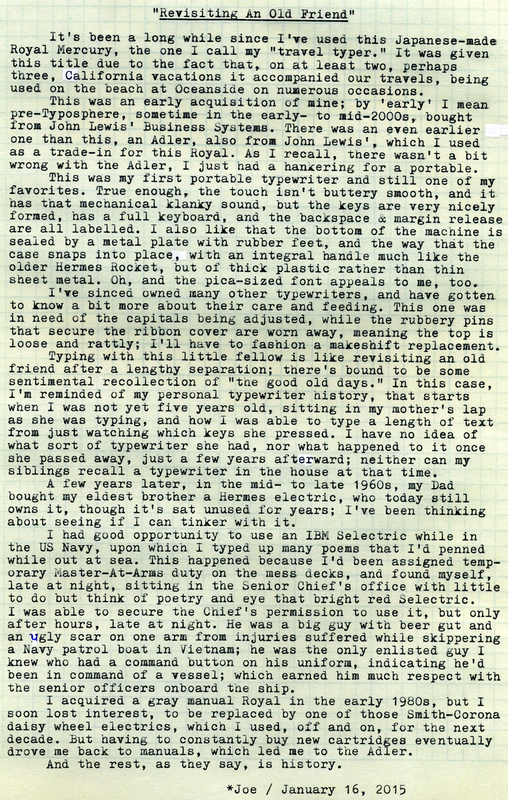 One detail left out was an additional source of inspiration for acquiring a manual typewriter, after ridding myself of the Royal from the 1980s, was from an old pal who worked with me in the TV repair business, who himself had a fondness for manual portables and used them to handcraft books of his personal life stories. As I recall, he purchased several portables over the years from Brown & Smith; who, as I mentioned in a recent article, are now out of business. Between typing the first draft and this finished version I did a bit of cleaning, lubing and adjusting to the Merc, including fixing the vertical position of the capitals, and resurfacing the pressure rollers such that the paper no longer slips near the bottom of the page. It remains an old friend indeed. Post-Script: I'm certain a significant part of my enjoyment of typewriters is the act of typing itself, enough such that there are times, while at work, that I can hardly wait for the weekend to begin. 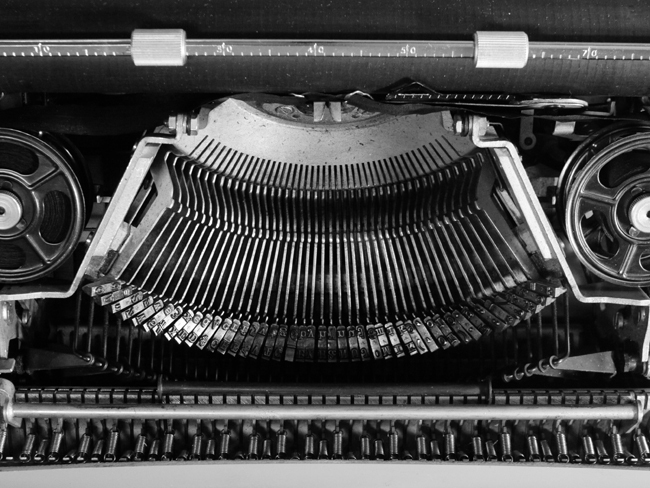 This is something that those who aren't intimately familiar with manual typewriters cannot possibly understand, as it's a notion counter-intuitive to the common misconception typewriters hold in our culture. 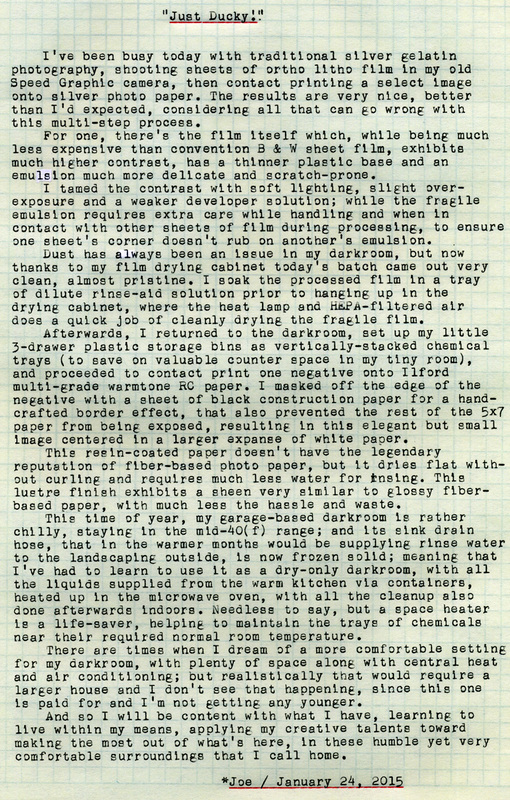 Similarly, I do also enjoy writing with fountain pen, enough such that it has been my usual method of writing first-drafts; although in the case of today's two-page article, I composed the first draft while seated in my front courtyard in the fading day's warm sun, typing onto children's manuscript paper using the tiny Hermes Rocket - which, I must say, has a very nice imprint for being of elite-sized font. The sun quickly set behind the shade of the house and thus the courtyard suddenly returned to its wintery chill (it gets well down into the teens at night, here in the high desert). So I finished off the final typing using the Smith-Corona Silent seated in my comfortable living room, watching NFL "foot" ball. I'm not necessarily a doom-and-gloom apocalypse "prepper," but I feel one should never take for granted the comforts of affluent western culture, were some unexpected disaster to befall us and we suddenly find our private stash of typewriters and manual writing paraphernalia to suddenly become well-prized booty for some potential horde of desperate writers. Now that would make an interesting story. Or blockbuster movie. 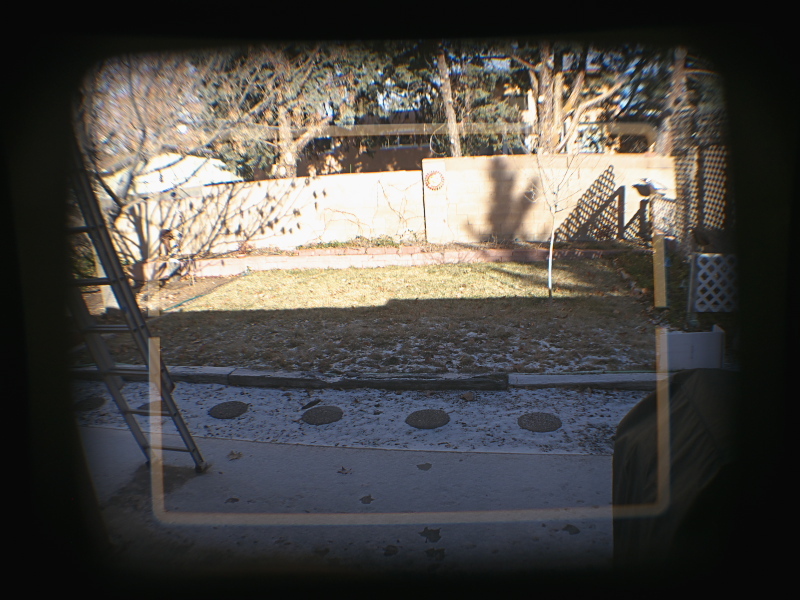 Post-Script: Here's a view looking through the Olympus VF-1, taken with my Lumix G5. It's actually much brighter and sharper than what this might imply. Did you notice how the brightly lit back wall in the viewfinder photo above is nearly blown out? That's a RAW FILE from a camera (the Lumix G5) with a much larger sensor than the little X10. 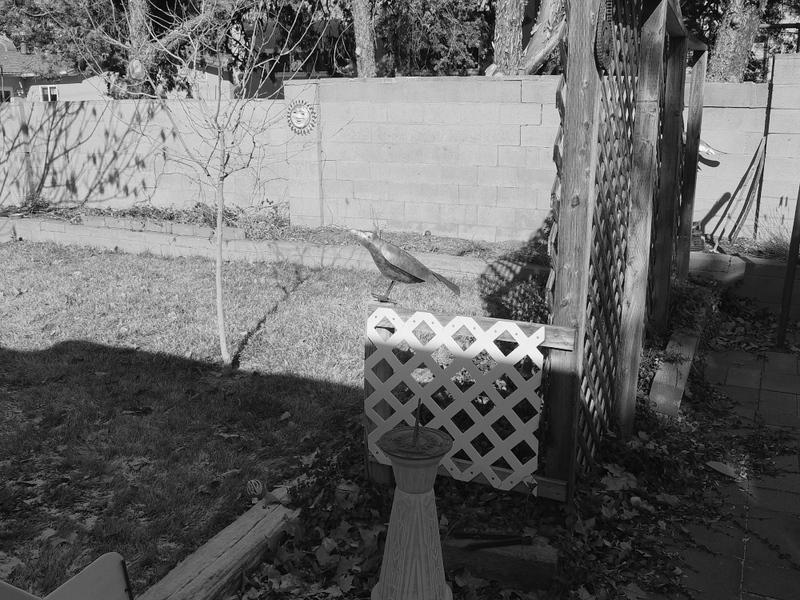 Now here's an example from the X10, shot in yellow-filtered black & white in the EXR mode, in very high contrast light. 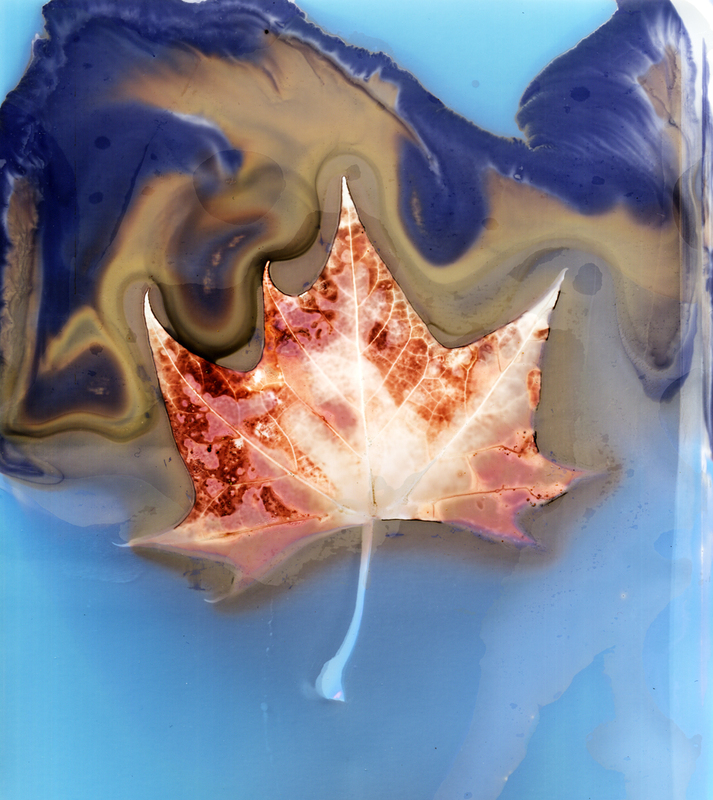 This out-of-camera JPEG image was barely adjusted and resized; I made no attempt at making it look pretty. Notice how much detail is visible in both the highlights and shadows, with much more room for adjustment, if desired. 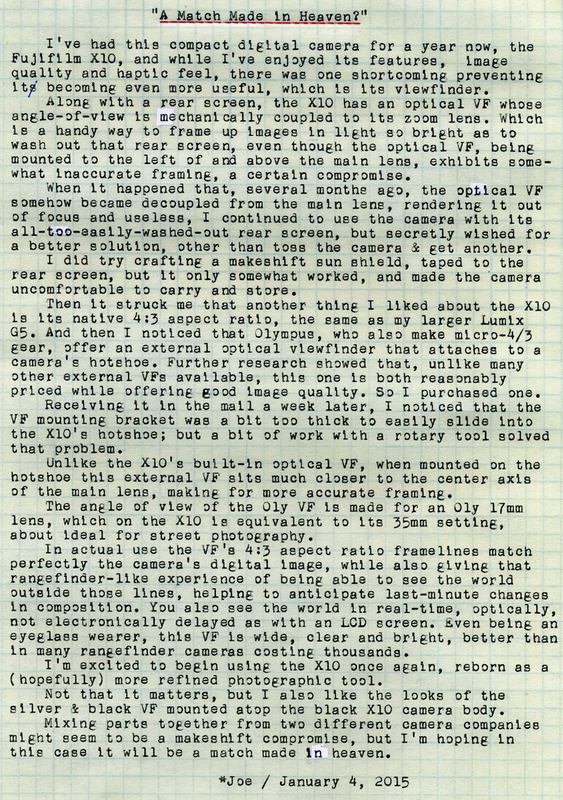 You might be wondering why all the trouble to make a half-broken, low-end, small-format digital camera useable again. Well, the X10 has what's called an EXR sensor, meaning that it's effectively a 5MP sensor with extraordinarily good dynamic range, that can also be configured as a 10MP sensor, with normal dynamic range, if so desired. As you can see from the above images, it boxes well above its weight class. Also, there's its smaller-than-a-Leica-yet-Leica-ish styling and haptics, with a sensor large enough to exhibit good image quality yet small enough to possess intrinsically wide depth-of-focus (an attribute not well appreciated in this age of excessive bokeh), very useful during quick-changing scenarios while photographing out and about in public. For the curious-minded, here are my X10 settings. Image size: medium, EXR mode: Dynamic Range 400. Together, these two activate the chip's high-dynamic 5MP mode. Then I use aperture priority, with film mode set to either Standard or yellow-filtered B & W; and focus either auto with center spot or manual with pre-focus set to five feet at F/4, which renders images in focus from 2.5 feet to infinity, with zero focus lag and instant shutter response. 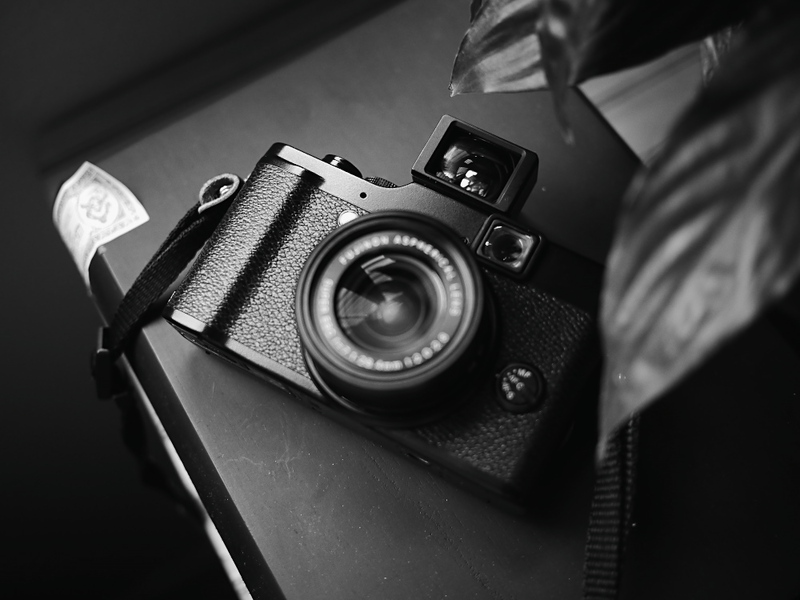 Fujifilm X10 portrait via Lumix G5; typecast via Smith-Corona Silent.